Over the past few months, full-page ads have been taken out by the largest pro-life group in the Mountain State, West Virginians for Life. You may have seen them. They are remarkable in that they publicly chastise their former best friend, U.S. 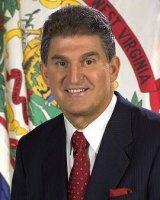 Senator Joe Manchin, for voting pro-choice at his first opportunity as the junior senator from West Virginia. If one were a cynic, this lover's quarrel would be amusing to watch. Old Joe--that unfaithful tramp--is getting hit with the couple's dishware for the vote that Democrats passed this April to continue federal funding for Planned Parenthood, a decidedly pro-choice organization. In doing so, Manchin helped send taxpayer dollars to a billion dollar business that chalks up 330,000 abortions per year. Senator Rockefeller voted for the bill, too, but pro-life West Virginians had given up on him years ago. However, Manchin was supposed to be different. After all, didn't he frequently call himself a conservative a year ago when running against a well-known conservative named John Raese? Indeed, Manchin did. And he must have done so with such charm that West Virginians for Life swallowed it hook, line, and sinker. Despite Manchin's pre-existing and publically-spoken support for Obamacare (which also supports taxpayer-paid abortions), West Virginians for Life gave a "joint endorsement" to both Raese and Manchin, even having their picture taken with Manchin days before the election. Naturally, Manchin used that picture to great effect to say to the voters, "See, I am conservative after all. After all, I've earned the pro-life endorsement!" So, do the guiding forces of the West Virginia for Life organization, Wanda Franz and Karen Cross, deserve credit for the pro-life group taking out these full-page ads across the state? Is this a strong statement? Or the whimper of a group that realizes it made a serious mistake in endorsing Manchin, who used them to get elected then cavalierly tossed them aside? Beyond the trauma undergone by West Virginians for Life, Manchin's support for Planned Parenthood and Obamacare has been a genuine shock for many of Manchin's conservative supporters. Taxpayer funding of abortions is one of the most controversial aspects of the abortion debate in the 21st Century. Some pro-lifers may not get revved up on certain pieces of legislation related to abortion, but they all seem to agree that they don't want their money going to support something they believe is immoral. Manchin's vote appears to be a signal to his national Democratic majority in the U.S. Senate. Otherwise, why lose so much good will in one of the largest conservative groups in West Virginia? Manchin is telegraphing to his Democratic colleagues that he is more than willing to play ball and stay in line, even when a core constituency back home has every reason to expect him to vote with them on a piece of legislation like this one. Joe Manchin is hardly the only U.S. Senator to have disappointed those who elected him to high office. But he may be among those who angered his base the quickest. By the time the dust had settled and his vote for Planned Parenthood was taken, Manchin had been in office for all of four months. ManchinWatch is an occasional report on U.S. Senator Manchin's service in Washington, D.C.